One model I have always meant to build was the Space Shuttle. Many, many years ago I built a full stack of the Moonraker which was released after the Bond film, but that’s long since joined the model scrapyard in the sky. In November 2002 I was fortunate enough to visit the Kennedy Space Center in Florida. At the time we were there the huge vehicle assembly building was open and we were lucky enough to be able to peer inside to see the nearly complete stack of the shuttle being prepared for it’s next launch held vertically in the building. That was Columbia being prepared for it’s launch on mission STS-107 which was to be its last. During re-entry on 1st February 2002 the wing failed and the orbiter broke up over Texas with the loss of all hands. 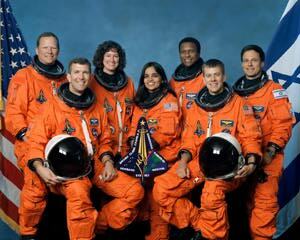 This was the 113th shuttle mission. We revisited the Kennedy Space Center again in November 2003 and I decided at that time to do this project which had been in the back of my mind for far too long. On arrival back in the UK I started to assemble the many components which would be required to complete the project. Obviously a lot of time has rolled on since I started this build and got completely stalled on it. I’ve since moved house and the half done model is still with me, although it suffered some damage to the tail during removals. But as the 10th anniversary of the Columbia Disaster is approaching I thought I would get this back out and try and get it completed. Had initially thought to do it by that date but not realistic now and will definitely miss that. So I will start by adding back online my original build pages to bring this up to where it was before stalling and then hopefully get going again. I still need to find some of the parts but I know that they were packed and it is just a matter of finding them.